It is with a heavy heart that I write to let you know that Jennifer passed away today, June 6. On Sunday, May 20, Jennifer entered the hospital with an intestinal perforation, ensuing infection, and acute peritonitis. Surgery was not an immediate option because of the Avastin she had been taking to treat her cancer as well as an unknown amount of active tumors surrounding her intestine. The plan was to manage her pain and treat the infection with antibiotics until enough time had passed after her last Avastin treatment that surgery had a chance of being successful. Jennifer remained relatively stable until Sunday, May 27 when a CT scan showed multiple new abscesses in her intestine and increasing amounts of fluid leaking into her abdomen. At this point the very best option for Jennifer was to make her as comfortable as possible until she made her transition. This past week and a half Jennifer has not felt any pain and she will never feel pain, fear, or worry again. She was surrounded by family and loved ones around the clock, and the wonderful nursing staff did an incredible job of honoring her grace and making this as dignified a process as possible. Jennifer loved writing this blog and she loved to hear from everybody from all parts of the world. Thank you to all of you for your support of Jennifer and for your thoughts, prayers, well wishes, and interest in following her story. If you are moved to, could you please send one last note and perhaps include the town or country where you are from. I will collect these for Little J to have when he is older. I will post once more when we have the details for the memorial service which will be in Novato (Sugartown) on Monday, June 11. Until then, I will leave this with a quote from Little J the morning after I told him mom was going to die. I think Jennifer would want us all to carry this with us. I did not know Little J’s mom. My cousin lived in Novato and forwarded a blog that mentioned Four Seeds. I got drawn in by the lovely writing and exceptional heartfelt nature of the beautiful blog. I am from Bergen County NJ, and the mother of an almost-3-year old named Sofia. If you are bitter and complaining because you feel like you don’t have enough, or others aren’t giving you enough, steer clear of me. If you lash out at people around you because you feel victimized or stressed by something you brought on yourself, steer clear of me. If you choose to see what’s wrong with every day when you have sweet little fingers reaching for you, needing you to be happy, steer clear of me. If you walk around with a scowl on your face, my door is not open to you. She was right to feel these sentiments, and I am grateful that she has made me rethink my own outlook. What a lovely woman. I thank her for sharing, inspiring, and for the impact she made on this world. I had the pleasure of working with your mom a few years ago and experienced her immense intelligence, creativity, and kindness. She will be missed, but as you say, her spirit will always be with us. We met Jennifer several years ago while visiting our sons..Jason and Marco. She was a very vibrant woman and an inspiration to us all. She had a beautiful smile. We are so sorry for your loss. Our deepest sympathy. I’m here from Sid’s blog… words cannot express my sympathy for your loss, or this poignant post. Condolences from Eufaula, Oklahoma. Dear Dennis and litlle J. There is no words to describe what I feel. I felt so grateful to know Jennifer. She was one of those rare kind of people, who comes into your life and make a difference. She touched everybody heard. Her spirit will be always with us.Thank you Dennis for the last blog and my big love goes to litlle J.
Wow.. Wow.. Wow… Jenn lived with such grace and died with such grace. The love she cultivated and nurtured in her heart for her son, her husband, her family, and everyone around her is an amazing gift that she gave and continues to give to us all. Thank you Jenn! Have a wonderful, beautiful, confident, and lovely transition! Hi. I live in Los Angeles. I had the supreme pleasure of knowing Jennifer while we lived in SF. She was roommates and best of friends with one of my favorite people, Karen. I had amazing, wonderful times with Jennifer. She was smart and funny and witty and loving and caring. I remember her best at the dance parties Karen and Jennifer threw. We put on disco music and sweated and danced and laughed together into the wee hours. I will have memories of Jennifer imprinted in my heart forever. I feel so fortunate and grateful to say that I called Jennifer my friend. I shall miss her and the Universe is a little less shining and compelling without her in it. Somewhere in the Milky Way, there is a brilliant twinkle star in the sky and that star is Jennifer. I love you, sweet girl. May you rest in peace knowing that you were, and forever will be, loved. I wrote a note earlier but I feel compelled to tell you more about my experience with your amazing Mommy. We lived together for four years at the top of Nob Hill in San Francisco in a beautiful apartment overlooking the bay. We met through an ad I placed at a roommate connection agency (long before the internet.) I interviewed lots of people who wanted the room but knew right away that your Mom was the one. I can still remember her sitting on my couch talking about poetry and music and yoga and I just thought that she was one of the most interesting and knowledgeable people I had ever met. She had on a really cool suede coat too. I liked her immediately. It is a big deal to live with another person, especially a stranger; to share your space, your moods, your life. We were each 26 when we started living together and we were both single. We quickly became much more than two people sharing the same space, we became fast friends, cooking together, exploring all the nooks and crannies of our beloved city, going to parties and bars and restaurants with Carolyn and Kathy and Mari and many others. We spent weekends with friends in the mountains and many afternoons hiking the hills of Marin. We spent countless hours chatting by the open window of our living room, drinking wine and sharing the events of our day, sharing triumphs and heartbreaks and many, many ridiculous dating disasters. We cried on each others shoulders more than a few times. We went as each others dates to parties and events. We hosted dinners, brunches and threw each others birthday parties. We painted the walls of our apartment while rocking out to the Beastie Boys played at full volume. The night I broke my elbow rollerblading all over the city, your mom held my eyelids open so I could extract my contact lenses with my one good hand. James, we threw *killer* parties. Somehow I managed to convince your mom to move all the furniture out of her bedroom so that her room could become the dance floor. We filled the apartment with flowers from the farmers market, cooked all day and dressed to the nines. And when the guests arrived we danced and laughed and celebrated being young and free and healthy. I have an image in my head of your mom with her arms spread wide, head tossed back with wild abandon singing at the top of her lungs. It is a picture I will always treasure. I was home the night your Mom returned, floating on a cloud, after meeting a cute drummer at a cafe. It was Valentines Day and she was out with another single girlfriend. The drummer, your Dad, sent over a drink. There was flirting and chatting. Your Mom, in an unusually bold move for her, passed him her phone number. When he called to ask for their first date, I answered the phone and passed the message along to your very excited Mother. I remember thinking the whole encounter was impossibly romantic and their story since then has continued to be so. I love your Mom like a sister and she has helped shape the woman I have become in more ways than she probably ever realized. I, like so many others, am a better person for having known her. She was beautiful and vibrant and bursting with intelligence and curiosity when we lived together but she really blossomed into the most remarkable woman once she assembled her little family with you and your Dad. It was a true joy to see her become the incredible Mom and wife she was. She had everything she had ever hoped for in you two. I wish you and your whole family peace and love as you process your loss. I know you know that her spirit is alive and well in all who loved her and that she will always be so very proud of you. It was such an honour to be Jennifer’s friend. I will miss you so much. We are so sorry to hear the very sad news. 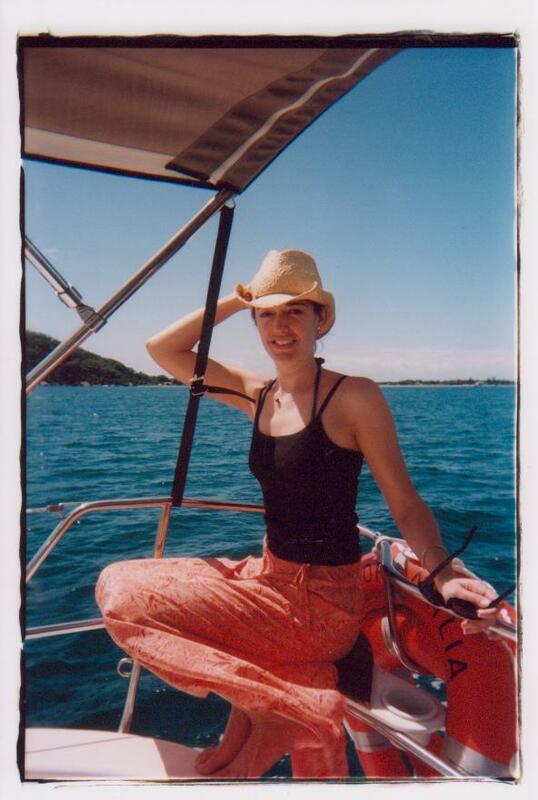 We have such happy memories of Jennifer’s stay with us in Fishbourne, UK several years ago. Jennifer is such a bright light. I am so grateful for her, for the offerings she gave all of us through four seeds, for how well she loves you both. I have cried so much in these past days, and am so comforted by your wisdom, James, for you are right – her spirit does live on and on and on. I am so aware of this, even amidst this sorrow – she helped me to see more fully, and to realize that what we can see is only a glimmer. So I am not trying to make sense of this, because I recognize that I can’t. Instead I am letting the waves of feeling wash over me, and consistently I settle into gratitude as over-arching. Hers is a bright light that penetrates so deeply in all of us. I am certain it cannot be extinguished. I have three angel panels on my wall from Jennifer, which she recently sent to me (someone she barely knows and amidst what she was dealing with herself) to help me deal with my own cancer journey. They are perfect for me, filled with messages I need!, and a great reminder of her extraordinary thoughtfulness, generosity and care. What an amazingly beautiful soul. My heart goes out to Dennis, James, Jennifer’s parents and the whole family. I was always struck at how strong Jennifer was, how brave through an ordeal that was long, painful and difficult. How amazing it was that she just accepted the pain, fear and doubt and just continued to take advantage of life. She was so pragmatic, so sensible. Cancer, operations, restrictive diets, chemotherapy…none if it was an excuse to not take advantage of life or be positive about each day. She approached each day with open eyes, an open heart and a heroic spirit. I loved the blog, and I will miss reading about their different adventures and trips, daily life in Sugartown, the stories of Little J. and Virgil and the insights that Jennifer realized. While I would have preferred to have been able to be there in person (which I was lucky enough to be at times), the blog was a great substitute for reorienting me when I was down or disillusioned. We spent some great times together over the years. So many memories, some from so long ago. I really thought that Jennifer was going to pull through and that she and Dennis and James would still be enjoying each others company fifty years from now, recounting how difficult that time was so long ago. Little J. is right, though. Her spirit lives on. Always elegant and intelligent, Jennifer’s natural way of making connections with people not only honored them, but made people feel right at home with her. Among many talents, that one was golden. Just a few months ago, I had the pleasure to go see the band James with Jennifer, Dennis, and Leigh. Jennifer was in the front row, arms high in the air, dancing, singing, fully loving the moment. I only knew your mom through the love your Dad conveyed when talking about Jenn and this blog. I have followed the blog religiously. Your mom’s words are so inspiring, her outlook on life was truly unique and she knew how to express what she felt in ways that very few people can, absent of bitterness and resentment. I have worked with your dad and seen him regularly over the past 5 years. He has a quiet strength that always amazed me. He cares so much about both of you. Even during tough times he never hid his kindness. As you said, your mom will always be with you now, may you feel her presence as life unfold ahead of you. I discovered your mother’s blog only today and am very moved. I have worked with your father for many years and always admired his care for others. Now I admire the 3 of you for the strong example of love that you share with all of us. Please come and see us one day in Shanghai or in France, when you feel like discovering new places and making new friends. From the moment I saw Jennifer and Dennis (your mom and dad) I adored them. They admired the gnome in our yard, it was New Years Eve and they were young, happy and joyous company. That is how I will always remember Jennifer. She cared so much about others even when she was fighting to stay with you in this world. She loved life and even fighting illness she seemed young and engaged, ready to take on the good fight and the bad. Your mom is probably the bravest person I will ever meet and I feel so fortunate to have known her although the time was too brief -much, much too brief. James, I met your mother during my first year of college. Kathy, Jennifer, and I were inseparable: we studied together, biked to the beach together, took road trips together, and grew into being college students together. We got our very first apartment together at the end of the year. That first summer, Jennifer and I stayed in Santa Barbara, completely independent for the first time in our lives. We worked, sipped mochas at Café Roma, explored Santa Barbara in Jennifer’s Avanti, befriended a disc jockey who gave us piles of free music and put us on the air, won big (for college students, anyway) in Vegas, and watched sunset after sunset from our porch on Sabado Tarde, just one block up from the ocean. Whenever I hear the opening notes of “Sweet Child of Mine,” I instantly think of us there, watching the sorbet colors fade to black and making plans for another balmy summer night in Isla Vista. During summer afternoons, Jennifer taught me the joys of coloring, the long-forgotten childhood pleasure of coloring books and Crayola big boxes with sharpeners in the back. Whenever I color with my kids, I think of Jennifer. Sophomore year, Jennifer and I decided to branch out from our literature courses and learn how to sail. True English majors that we were, we spent far too much time delighting the language of sailing (Boomvang! Cleat the halyard! Helms alee!) than in the angles and wind speeds and other technical details; you won’t be surprised to hear that it was our boat that almost crashed into the pier and then was nearly beached. After each lesson, it became our ritual to go to 7-11 for slurpies. Jennifer knew every flavor and was a true connoisseur! As the years passed, we took separate but sometimes parallel paths: travelling, going to grad school, teaching English, starting families. We went to each other’s weddings, visited each other in San Francisco and San Diego, and grew up. But one of the things I love most about Jennifer is that she only agreed to the parts of “growing up” that suited her. She kept her crayons sharp. As a parent, I try to channel my inner Jennifer all the time. I try to delight in the little things, think deeply about what is important, give myself over to joy as often as possible, and sing just because I know the words. When I visited you last summer, your mother introduced me to her favorite author, Ann Patchett. I think Jennifer has taught us all the value and the beauty of this quote from State of Wonder: “Never be so focused on what you’re looking for that you overlook the thing you actually find.” Your mom found so much in this world to contemplate and appreciate and love, even in the midst of battling cancer. She certainly wasn’t looking for this fight, but she never let it stop her from finding beauty along the way—in nature, in words, in people, and in everyday miracles. As I strive to do the same in my life, it always will be in her honor. I remember your mama Jennifer only on sunny days. Once at you birthday party in a fun park, another at Max’s , once at a picnic where it was scorching hot! but she was wearing a big round rimmed hat that made her look like a movie star. : ) Even when we met her indoors , or an evening out, it seemed like a sunny day because she was there. I can still see her smile. She radiated life and brilliance, and every moment we shared with her was a moment of joy, intellectual curiosity, optimism. We liked her… we liked her very much and now, because of all that she left us, we love her. Today you may be a bit young to understand but one day you may read back on this and it will all feel different. We will all leave this wonderful place some day, it is just the way of life but there is something that makes our time here last forever and that is the love we give to others. The more we give it away, the more it stays and grows. “What will remain of us… is love”. Jen’s love is with you and with us always. I shared a year in Granada with your Mum and feel very honoured to have been her friend. Jon forwarded the link to her blog to me today and I’m still reeling from it all. Jennifer is just as I remembered her – with the huge smile, huge heart and great lover of life. I’m so sorry for your loss, but her spirit does definately live on. All my warmest thoughts for you both. Peace and blessings to you both, and to family and the huge circle of people who never met Jenn, but whose lives were enriched through her words. Jenn was Big Love, and there is a gaping hole in the world now. I “met” SuperJenn on Inspire, and we chatted about yoga and life and ovarian cancer. I know she was a friend of Sarah Carcinista too, and the two are making heaven a more chic and playful place. Little J, Jenn will live on through you and through the countless lives touched by her physical friendship, and those of us who knew her only through her words; I ope this blog will stay up so we can refer others with OvCa. Little J, when you get older and read these comments, you will know what a singular woman your mother was; she was able to write about love and optimism and hope while she endured this cruel disease that seems to make you take two steps back for every one you take forward. Her love for you was so huge I cannot think of adjectives worthy of it-I don’t have her gift. You already know her spirit will always be with you. So, Friday July 6th marked one month since Jenn’s passing. I think it’s fair for me to suggest that her passing has left a hole in the heart of every person she came into contact with. I’m sure Jenn, the way she lived and her writings have inspired everyone in different ways. For me personally, I know I was inspired to make an effort to shift my focus and make sure I express myself creatively in some small way every day. One of the ways I set out to do that this year was to start taking Improv classes at a place here in Los Angeles. That’s something I had always secretly been interested in trying but just hadn’t for whatever reason/excuse. I took two intro classes. In order to move forward in the program an audition was required. In the old days, I would probably have reasoned my way out of that by thinking that I had gone far enough in the program for a non-actor and then be done with it. This time, I made a different choice. I looked up the schedule on line to find that there were auditions being held on July 6th. I somehow felt it was meant to be. I took time off from work and off I went. The entire time I was there waiting and nervous I thought of her bright spirit. Somehow I felt as though I was paying a tribute to her. It wasn’t until I left.. not knowing if I had passed or not that I realized why what I did WAS in fact paying tribute to Jenn’s spirit. I realized that whether or not I passed the audition didn’t matter. The important thing was that I DID it and that goodness lies in the activity rather than the outcome and I think she would have agreed with that. She set an example of that in so many ways all the time. I thinks she inspired us all to think a little differently, to make a different choice every now and then and to understand the Joy that comes from being a willing participant in our own lives, every day. I’ve decided, for the rest of this year, on the 6th of each month, I’m going to honor her spirit by making one choice differently on that day. Here’s to Jenn and the beautiful way she shared all the joys of her world with all of us. oh.. P.S. I passed my audition. Good things happen for those who participate. : ) Thanks for that Jenn! I worked with your mom, Jennifer, at Leapfrog from about 2002-2004. We became friends and when I moved back to New York City in 2004, we stayed in touch mostly through email. I also got to visit with her twice when she was in NYC, which was a big treat because, as you know, you mom was a really wonderful person. Your dad (who is pretty darn cool too) invited people who knew your mom to share some memories of her so he could share them with you one day. Here are some of my memories of your mom. Your mom and dad shared quite a love story. When I first met her, your mom and dad had recently gotten married. She showed me their gorgeous wedding album. I’m sure you’ve seen it. She was so happy about the whole day, so in love with your dad. She also told me about the night she first saw and met your dad. She and a friend (maybe Caroline?) went out and there was a band playing. I can imagine what a fun time that must have been. One musician was just so cute! Their eyes met. Yup, that was your dad. It was a true love story. Your mom had this easy glamour. She was very beautiful naturally (inside and out). I remember her wearing a long black skirt, a fitted jeans jacket, and a scarf wrapped around her neck a couple times. Just elegant and lovely. And her short bob haircut. She was striking. This glamorous touch extended to food and cooking. I remember her having what she called her “bear lunch,” which was salmon and blueberries, kind of like a bear might enjoy from the woods. I also remember her mentioning a yummy recipe for tandoori shrimp that she’d just “throw together” sometimes when entertaining friends. She was also really good at being silly. She loved to use a silly pen, like one with a lot of pink feathers on it. She’d have little neat objects on her desk at work. A fun shiny rock, a cool ball. She was very organized and her desk was neat, but she’d add these cool touches. She was a really good writer and she really valued writing. One project that we worked on together required us to write short little stories around teaching a particular lesson. She and I were on the English and Language Arts team along with a woman named Annice. We’d get a theme (like long vowel sounds, for instance) and a little bit of information and then we had to whip up this lesson/story really quickly. Your mom was lightning fast. I was astounded at how she could just turn on the creativity and go. But (see below) she also complimented me when I said I would need more time to write mine. She said it was really good that I was setting limits. She knew how to set limits. I learned a lot about how to be a professional from working with your mom. She knew what was really important in her life and she wanted to put those thing first. She struggled with this sometimes because she was really good at her work and in high demand, but it taught me some really good lessons on valuing yourself and what you do well and not letting people take advantage of you. She was kind and generous. She taught an early morning yoga class in Albany. When I lived in CA, I didn’t have a car and there’s no way I could go to that class except that your mom would pick me up in her car and drive me there so I could attend, and then we’d drive together to work at LeapFrog in Emeryville. And we’d usually get a latte at the little café next door to the yoga studio after the class. Those were magical moments for me. I remember Norah Jones playing on the car stereo. I remember her showing me how to use the seat warmers, which I had never seen before and thought were really neat (not to mention comfortable). She really loved New York City. She and your dad came here once before you were born to watch the Macy’s Thanksgiving Day parade. They had such a fun time. She loved the energy and spirit of New York. And she thought it was really neat that I grew up here. James, if you ever want to come to New York for a visit (and I’m still living here), you absolutely have a place to stay. This offer is good for life. No expiration date. I mean it. She loved you oh boy so so so much. She loved being your mom. She loved watching you grow. She loved spending time with you. She loved spending time as a family. I really think that one of the big reasons that she was at peace when she passed away is that she was surrounded by your love and she knew she had achieved something so wonderful by having you and making a family with your dad. You have her spirit in you. I hope knowing that helps you feel close to her.